Seven items reached the Urdd National Eisteddfod this year with three managing to get to the stage finals. Many congratulations to the Recitation Group and the Mixed Media Dance Group on winning their competitions, and to the Orchestra for coming third in their competition. Other pupils who travelled to Bala are to be praised for their efforts - members of the Choir, Cerdd Dant Choir, Creative Dance Group and Instrumental Ensemble - although they not get to the stage, their performances were of a very high standard and we are very grateful to them along with everyone who spent their time coaching and preparing the pupils, for their hard work during the last few weeks. We look forward to seeing all of these items again at the Summer Concert which will be held on the 10th June. Congratulations to one of our Year 2 pupils, Caitlin, on her recent success at the Royal Welsh Spring Festival. 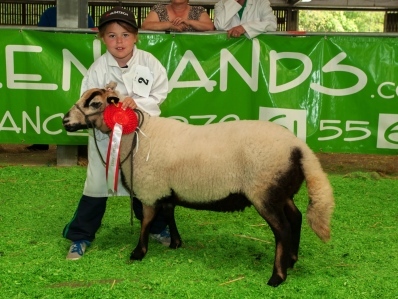 Caitlin managed to win her category, the Young Handler 5 - 7 yrs in the Sheep Section. Caitlin enjoys handling sheep, and she frequently attends various shows throughout the year. Well done Caitlin, and best of luck in future shows. On what promised to be wet evening, the sun shone brightly once again on this year's Sponsored walk. Many thanks to everyone who supported this event again this year. It was great to see so many taking part - pupils, parents, relatives, staff and past pupils all enjoying a leisurely walk along the various footpaths: along Plascrug Avenue for the little ones and to the cricket field and back for the older children. A big thank you to ex-pupil Daniel Davies who will be competing tomorrow in the Aber Cycle Fest for opening the evening, and thank you also to Tŷ Nant for sponsoring the walk and providing us with hundreds of bottles of water for the thirsty walkers. Many congratulations to Gwen of Year 5 and Tomos of Year 6 on their fantastic recent creative writing achievements. We were thrilled when we opened an envelope from the National Urdd Eisteddfod which included certificates and medals stating that Gwen had won the prose competition for yrs.5&6, and Tomos coming third in the poetry competition, also for yrs.5&6. Excellent! 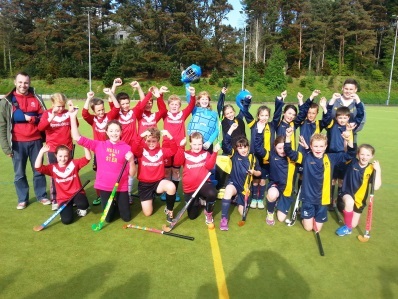 On the final evening of this season's hockey matches, a tournament was held at the Aberystwyth University's all-weather pitch, with both of the school's teams reaching the final. However, congratulations go to Taranau (Year 6 pupils) on winning a hard fought final against Mellt (Year 5 pupils). It was a close match with every player doing their best for their team. We welcomed Tommo to the school today as a few of the pupils took part in an item he has on Radio Cymru. Next Tuesday and Thursday afternoons the children will be answering a few 'different' questions on the radio! We look forward to hearing what they have to say! For the second year running, Aberystwyth's May Bank Holiday Eisteddfod was held at the Morlan Centre with many of the school's children competing. In the photographs you will see pupils of all ages competing in a variety of competitions such as singing, reciting, acting, dancing, eating biscuits without hands (!) and the school's Instrumental Ensemble also competed. Thank you to everyone involved in organising the Eisteddfod, and to Tegwen Morris for the photographs. Congratulations to the pupils pictured on their success in a competition held at the Science Exhibition at Aberystwyth University recently. Whilst roaming the exhibition the pupils were asked to answer a variety of questions correctly, and these are the pupils who reached the top! Thank you once again to Aberystwyth University for organising the event and for such wonderful prizes.